The nave, chancel, tower, north chapel and aisle look C14 in origin, but most was rebuilt in 1663, with a large chapel with C17 and C19 monuments. A south aisle was added in 1844. 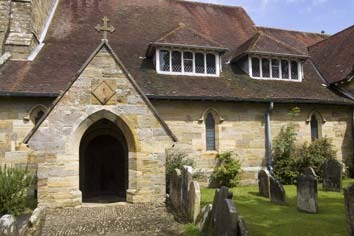 The parish of Withyham remains one of the largest in Sussex and includes much of Ashdown Forest. 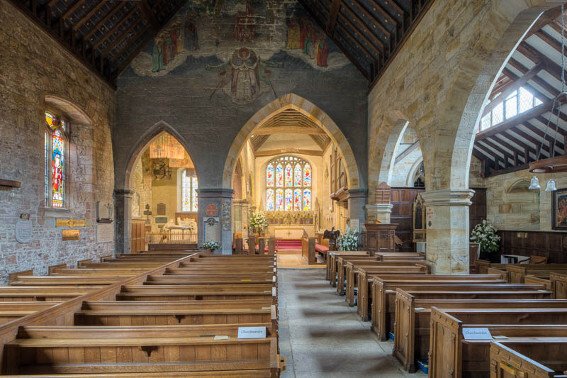 Within its boundaries is the chapelry at Blackham, but no longer the present parish of St Thomas, Groombridge or the western outskirts of Crowborough, for which a chapel, St John, was opened in 1839, which became a separate parish in 1871. Withyham church stands on a rise with fine views from the churchyard as far as Hartfield church. 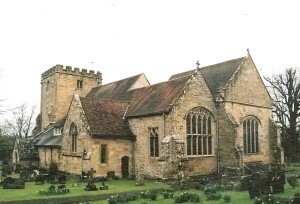 Rebuilt after damage by lightning in 1663, it incorporates what was left of the nave, chancel, north aisle and tower of its predecessor, which was mainly C14, though some rubble walling noted by Hussey (p306) may have been earlier. All the church is built of dark sandstone ashlar. The lower part of the tower was little damaged, with angle-buttresses and a moulded west doorway. The three-light window of C19 intersecting tracery replaces a similar one in the Burrell Collection drawing (1783). It could have been C14 or C17 and the element of doubt demonstrates the conservative nature of the C17 repairs. The date of the two-light bell-openings is similarly uncertain, though on the Burrell drawing the west one looks segmental. Definitely C14 are the tower arch, with semi-octagonal responds and a double-chamfered head, and much of the chancel, with a single square-headed south window, with big pierced spandrels. A restored piscina and sedilia (see below) must be in situ. The other C14 work is harder to find, like the mouldings of the almost round-headed south doorway, reset in the south aisle, which must have been altered. In the undated Sharpe Collection drawing, the then south wall of the nave looks largely C14, with a four-light square-headed window and two two-light ones – at least one had pierced spandrels. A sundial dated 1672 that may mark the conclusion of the rebuilding is now on the south porch. 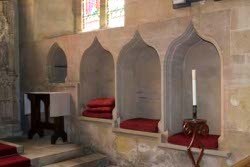 The semi-octagonal south respond of the chancel arch may be C14, though the single heavy chamfer on the rest looks C17, possibly altered in the C19. The undersized battlements of the tower are certainly C17 and so is the large east window, with a depressed head, intersecting tracery and a transom. The biggest change was the removal of the north arcade, causing the nave to appear offset to the north. Hussey is surely correct in dating this to the C17 reconstruction (p306); Pevsner’s suggested date of 1841 (BE p638) is unlikely, as the north arcade would hardly have been removed at the same time as a south one was added. The effect of the removal would have seemed less odd when the nave had a flat plaster ceiling and the chancel was little used, as was usual in the C17. 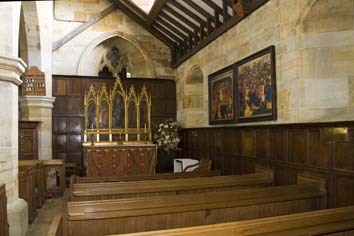 The C17 north chapel dwarfs the chancel to its south. It replaces an earlier one, of which nothing remains (1 p1) and which probably also contained family memorials, though Godfrey believed it was smaller (4 p112). The date of completion is in doubt; it was either by 1672 (1 p1) or not until 1680. If the latter, it may have been started after the death in 1677 of the son of the 5th Earl of Dorset, the main landowner in the parish (for his monument see below). It resembles the other C17 work, especially the east window, which is a four-light version of the one in the chancel without a transom and the blocked north window was probably similar. A two-bay arcade between chancel and chapel betrays its date by the round-headed arches; the single arch into the nave is pointed, but the shallow mouldings on the elongated pier between it and the chancel arch are C17. The chapel had a C17 painted ceiling, described by Horsfield (I p395) as having a carved angel holding a trumpet, surrounded by fruit and flowers, with further angels at the corners. The blue and gold cusped panels of the present ceiling are probably a C20 redecoration of a C19 alteration. The dates of the C19 restoration are known, but no architects. Work started after R Sackville-West, later 7th Earl de la Warr became rector in 1841 and continued, no doubt intermittently, until 1864, by which time almost all the interior plaster had been scraped and replaced by obtrusive pointing. It is likely that the rector himself oversaw the work. The south aisle dates from 1844 (KD 1874), with a porch and a conventional three-bay arcade, and the chancel arch may have been altered then. A heavy open roof over the nave and former north aisle and that of the chancel were replaced in the course of the restoration. The aisle west window may be the C14 one with pierced spandrels that is visible on the Sharpe drawing, reset and renewed. The remaining detail is C14 in character, save the dormers in the roof. To the east, an organ chamber conceals the western chancel. There were repairs in 1960-61 by Denman and Son (ICBS). 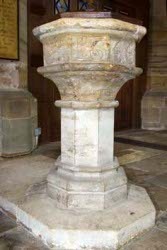 Font: Dated 1666 on the octagonal bowl, which is plain except for a moulded base. Aside from the date, it is smaller than a mediaeval one. 1. (North nave, second and third windows) These are no doubt the two heraldic windows supplied by J Powell and Sons in 1855 (Cash book). They display heraldic glass depicting the arms of families who married into the Sackvilles. Christopher Whittick (6 p2) suggests that it dates basically from the C17 rebuilding, although none of the marriages commemorated is later than the C16 and one occurred in the 1480s. If so, Powell and Sons’ work was more in the nature of a restoration, which given the date, while the future earl was rector, would be entirely plausible. In that case, his further suggestion that this glass should be seen as part of a deliberate effort by the Sackvilles to reflect more worthily their position is also plausible. Assuming Whittick’s dating to be correct, this would follow their elevation to the peerage, culminating in becoming Dukes of Dorset. 2. (South chancel) J Hardman and Co, 1852 (Order book). 3. 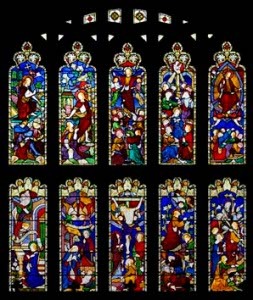 (South aisle, first and second windows) C E Kempe, 1904 and 1905. 4. 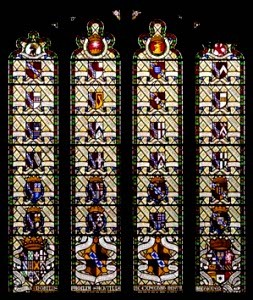 (North chapel, east window) T Willement, 1853 (Willement ledger); heraldic glass, depicting the Sackville family tree and costing £110. As a memorial to family pride, it fits the rest of the chapel. 5. (South aisle, third window) T Willement, 1847 (ibid). 6. (South aisle, west window) J Hardman and Co, 1854 (Order book) and now very worn. 7. (North nave, first window) J Hardman and Co, 1865 (ibid), presented by King Charles Frederick Alexander (as his name is rendered) of Württemberg, after he worshipped here, apparently as long before as 1853. 8. (East window) J Hardman and Co, 1855 (ibid). The vivid colours are old fashioned by this date, particularly for such a leading manufacturer, but the source leaves little room for doubt. 1. 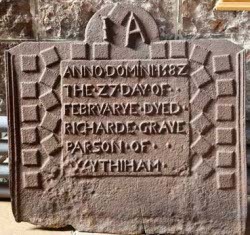 (By tower arch) Iron tomb-slab to William Alfry (d1610). A second one, to Robert Baker (d1585) is now at Anne of Cleves House, Lewes (Llewellyn p413); it was possibly removed after the fire. 2. (North chapel) Thomas Sackville (d1677 aged 13) by C G Cibber (Roscoe p275). 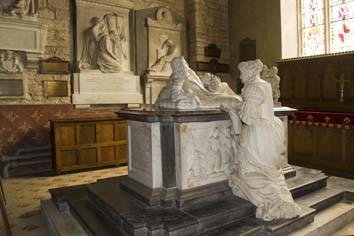 The boy lies on a tomb-chest, holding a skull. On the sides of the chest are his brother and sisters, recalling earlier C17 custom and mediaeval weepers (2 p121). Despite the expressive effigy, the revolutionary feature is his grief-stricken parents, kneeling either side, as if drawn back to the tomb. 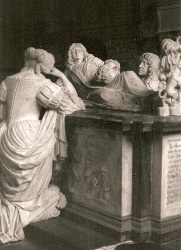 It is altogether more successful than the other major late C17 tomb in Sussex to show the influence of Italian Baroque, that by J Bushnell at Ashburnham. The contract with Cibber was for £350 (Faber p42). 3. John Frederick Sackville, 3rd Duke of Dorset (d1802) by J Nollekens (Roscoe p901). Three putti place a wreath on an urn bearing a portrait of the deceased. The sculptor himself is known to have supervised the erection of the monument (6 p3). 4. George John Frederick Sackville (d1815), 4th Duke of Dorset by J Flaxman. A mourning woman in classical draperies beneath a portrait medallion (SAC 97 p86). 5. Arabella, Duchess of Dorset (d1825) By Sir F Chantrey (M Baker p233) showing two draped women mourning a classical urn with yet more draperies. These are supposed to represent the Duchess’s two daughters, recorded in the inscription. 6. George John Sackville-West, Earl de la Warr (d1869) by W Tyler (BE p639). A young woman holds a wreath against a background of waves in a late survival of neo-classical sentimentality. 7. Vita Sackville-West (d1962) A slate inscription cut by R Stone (V and A Museum: Stone, p78) and a welcome relief after so much grief in white marble. 8. (North nave) David Maxwell-Fyfe. Viscount Kilmuir (d1967) by J Skelton (Church guide). 1. (South aisle – previously) For many years what were described as C13 and C14 Italian paintings in dirty condition were on show. Expert examination led to their ascription to the late C14 Florentine artist N di P Gerini and following restoration, for reasons of security they were removed to Leeds Castle, Kent (5 p4). Most recently, the attribution has been questioned and according to a notice in the church (2016), they are currently in London undergoing further examination. They were presented to the church in 1849 and full sized photographs are now displayed. 2. (Over chancel arch) The dim remnants of a Last Judgement, painted in 1856 by R Sackville-West. Even less remains of a figure of St Michael in the south porch by the rector’s sister, Lady A Bannerman, dating from c1869 (5 ibid). Piscina: (South chancel) C14 with a pointed head. Railing: (Around the north chapel) Low and likely to be of C17 Sussex manufacture (1 p2). Reredos: Mosaic work by J Powell and Sons, designed by C Hardgrave (Hadley list), inserted into an existing one in 1880 (CDK 1880 pt2 p119). The boards from its predecessor, bearing the Creed, Commandments and Lord’s Prayer, are displayed by the tower arch. From the style of the lettering they are probably C18. Sedilia: (South chancel) Restored C14, moulded with three ogee-heads. 1. My thanks to Nick Wiseman for most of the colour photographs. He also alerted me to the most recent developments concerning the Italian paintings. 2. 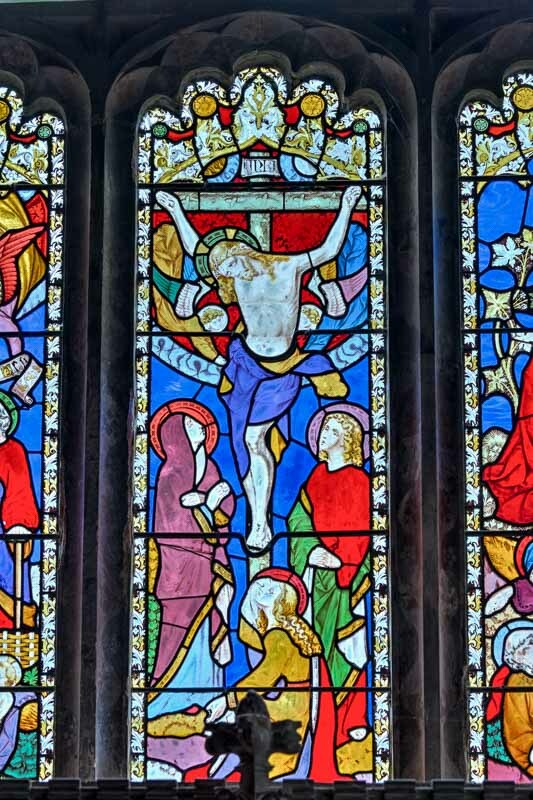 My thanks to Mike Anton for the photographs of the east window (detail) and the nave looking east.